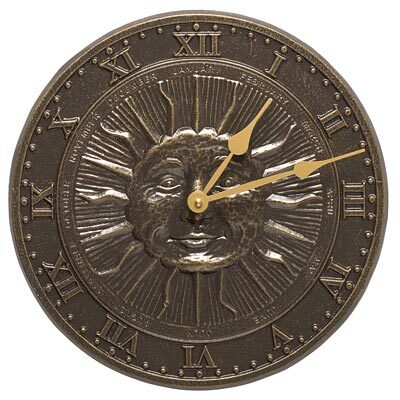 Brighten your day with the Whitehall Sunface Clock. The months of the year form a smaller circle inside the hours, with the smiling sunface's rays radiating toward them. Large Roman numerals and tick marks line the perimeter and are easily viewed from across a room or patio area. This timepiece's solar theme will surely complement any home or outdoor sanctuary. The recycled aluminum construction and durable finish ensure that this clock will look great whether hanging in your home or patio. Operates from a single AA battery (included). Made in the USA.